NASA hastapped a senior manager at its Goddard Space Flight Center in Maryland to leadthe investigation into Tuesday?s failed launch of a new global warming satellite,the space agency announced today. RickObenschain, deputy director of the Greenbelt, Md.-based Goddard Space FlightCenter, will spearhead a five-person mishap investigation board aimed atdetermining why NASA?s $273.4 million OrbitingCarbon Observatory (OCO) crashed into the ocean just minutes after its of earlyTuesday liftoff. 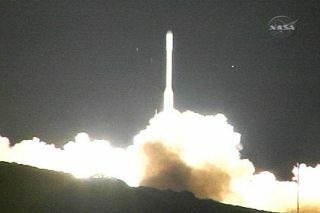 An OrbitalSciences, Corp.-built Taurus XL rocket launchedthe OCO spacecraft into the predawn sky from Vandenberg Air Force Base inCalifornia, but the rocket?s protective nosecone shroud failed to separate asplanned about three minutes after liftoff. The failure prevented the rocket fromreaching orbit and sent the OCO spacecraft plummeting into the ocean somewhere nearAntarctica, NASA officials have said. The fourother members of Obenschain?s investigation board will be announced later asthey are selected, NASA officials said. ?The boardwill gather information, analyze the facts, and identify the failure's cause orcauses and contributing factors,? NASA said in a statement. ?The [MishapInvestigation Board] will make recommendations for actions to prevent a similarincident.? The OCOspacecraft was NASA?s first Earth-watching satellite developed exclusively to maplevels of carbon dioxide, a greenhouse gas, to help determine humanity?scontribution to global warming. It was slated to lead a train of other Earth-monitoringsatellites already in orbit to build a complete picture of the planet?s weatherand climate changes. Of the 30billion tons of carbon dioxide produced each year, humans contribute about 8billion tons ? primarily through the burning of fossil fuels, OCO researchershave said. While some of the gas is reabsorbed by Earth?s oceans, researchershoped the OCO spacecraft would be able to identify where the rest is absorbed bythe planet?s landmasses. At theGoddard, Obenschain shares executive leadership, direction and managementduties for the center and its programs and projects. His duties also include providingoversight and technical evaluations for the development and delivery of Goddard?sspace systems launch and operations, NASA officials said. During hisNASA tenure, Obenschain has held a number of project management positions atGoddard. In 2004, NASA appointed him director of the Flight ProjectsDirectorate, where he provided day-to-day management for more than 40 space andEarth science missions, agency officials said. Obenschainhas received NASA?s Distinguished Service Medal, Exceptional Service Medal,Equal Opportunity Medal and the Goddard center?s Award of Merit. He also receivedthe von Braun award for excellence in space program management from theAmerican Institute of Aeronautics and Astronautics, NASA officials said.